If you kids love the Teenage Mutant Ninja Turtles and LEGO then this TMNT LEGO style backpack is perfect for them. This backpack is 16 x 13 x 4.5 making it the perfect size for school and other adventures. 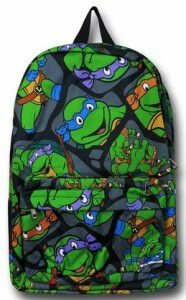 The backpack is blue with on the front the faces of the 4 Ninja turtles and they seem to be made out of LEGO bricks and there are more LEGO pieces on the design. 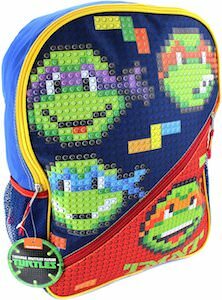 The Teenage Mutant Ninja Turtles backpack has adjustable straps and mesh side pockets that are perfect for a water bottle or some snacks. Back to school will be fun again all thanks to this TMNT backpack.